Fred Saberhagen’s Berserker series discussed the concept of “the noble enemy.” The Berserkers in the series were self-replicating robots programmed to destroy anything and everything alive. They were a “noble enemy” in the sense that they can’t ever be converted to non-violent behaviour, so the only noble act upon encountering them, was to do everything you could to destroy them. Another common noble enemy in fiction are zombies. In many cases they are portrayed as unredeemable beings, bent only on savagery and consumption of pretty much everything organic, with a specific hankerin’ for the brains of non-zombified humans. Zombies appear in both the fantasy and science fiction genres, created by supernatural forces in some cases, and by complex genetic modification technology in others. 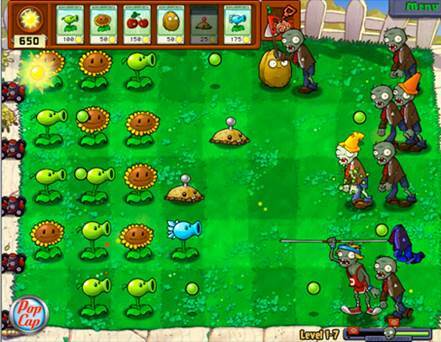 Plants versus Zombies from Pop Cap Games” uses zombies as the antagonists in an arcade style computer game (including a cartoon version of the recently deceased Michael Jackson). I recommend this game, not just for its playability, but also for anyone studying game design. In addition to 50 levels of plant versus zombie game play, the game has numerous sub games which open up as you progress, and games which are variations on the main theme, all of which allow you to make money which can be used to buy items to help with other parts of the game. There’s even a variation of the well-known game Bejeweled called Beghouled. The game also manages one of the rarest and most precious of gaming feature combinations. It is both complex and easy to learn how to play. Some games require a huge tutorial before you can even get past level one, while others are easy to learn, but have game play so simple that the game is dull. Zombies explains itself in simple steps, getting more complex as you go along. In fact the Help section, is simply a letter from the zombies telling you to sit back and do nothing. When you complete the 50 levels of ‘Adventure Mode,’ the zombies decide they’d rather do a music video with you than eat your brains. This suggests they may not be pure ‘noble enemies’ and might be capable of a level of redemption after all. If you don’t want to work through 50 levels to see this J-popish video, search YouTube for “There’s a Zombie on Your Lawn,” written and performed by, Laura Shigihara. 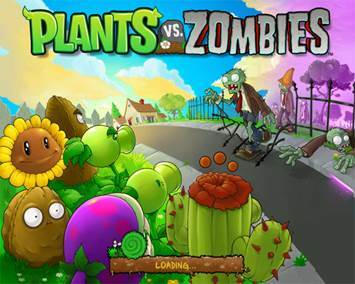 This game contains cartoon violence, including scenes of zombies losing body parts and anthropomorphized plants being eaten. Parental digression is recommended. Originally published in Neo-opsis issue 17.